hello, hello, happy holidays everyone! ... and I could no longer resist the pull of those hexis! It's from an out of print magazine that I photocopied many years ago, maybe back in 2009? The focus is on hexagons, how to slice them up and play with different variations. What are your sewing plans for the new year? Your hexis are looking good, I am working on Sue Spargo project with my sister and Santa gave me The New Hexagon book for Christmas, so I think I am seeing hexi variations in my future too. All the best for 2017 and happy creating. Thanks for linking up with Oh Scrap! These are so pretty! Love your up cycling of the the embroidered finds. Happy and creative 2017 to you! What a wonderful way to use your doilies etc. 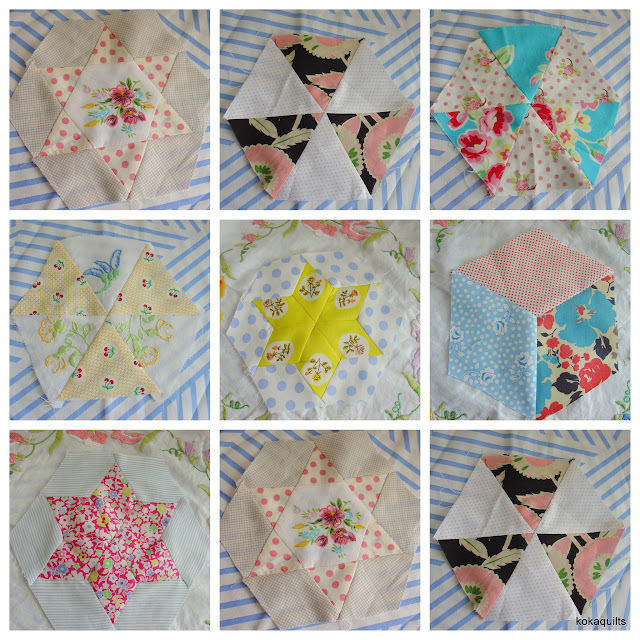 I have lots inherited from an aunt and old embroidered table cloths which Mum made when I was small. The fabrics you're using were obviously just made for mixing with these embroideries. Thanks Maureen There’s not a lot of time at present for sewing here, but when I can I make a couple more blocks. They are certainly quite addictive, and sweet! I’ve played with embroideries & quilts before, lots of fun, lots of memories. And really nice to recycle some of my mum’s doilies. That looks like so much fun! Great blocks. Love your new header too. Wow, this is such a light and lovely project! I'm on a little vacation at the moment, but when I get back I look forward to sewing up some new couch cushion covers that I have planned! Ohhhh, so very pretty! What a beautiful pattern for all your embroidered linens. That is going to be so pretty, Linda! I love all the sweet fabric and embroidery you're putting together! What a brilliant idea, using all those old treasures in the hexies; they match your fabric choices beautifully. I also like all the variations in the hexagons themselves. This is going to be great.